We are in the midst of an employment revolution. Conventional, full-time employment is shrinking, while the part-time workforce continues to grow. out of his home shop. Checking for any swirls or imperfections in the paint. Santa Barbara Auto Detailing goes where the customers are. with two new distribution centers. Rob Regan has been detailing cars for over two decades. When examined with traditional metrics this shift in employment can cast a gloomy shadow, but for those that make their living in this new marketplace it is simply a more evolved approach to work. Whether they are members of the gig economy (Uber for example), freelance workers, or good old-fashioned part-timers, participants in this new workforce model are helping redefine employment in the modern age. 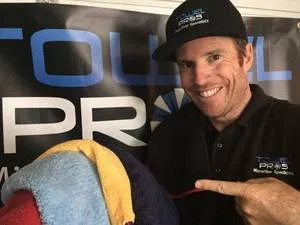 Rob Regan has more than 20 years of detailing experience and owns and operates Santa Barbara Auto Detailing, but he has never been a full-time detailer. Regan is a renaissance man. 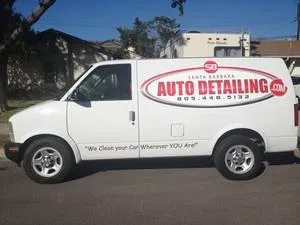 He has been an elementary school teacher since 1993, runs a detail supplies business, and has a successful mobile detailing service in Southern California. Stay busy he does. During the school year, it is not uncommon for Regan to head off to work with his work/personal van fully loaded with detailing supplies, ready to rush off to a client’s house when the school day ends. When school is in session, Regan typically processes a few maintenance details during the week, saving the more intensive complete details for the weekend. Regan’s detailing story is not typical. When asked about what drew them to the industry most successful detailers will point to a lifetime love of the automobile and an obsession with keeping them clean. However, for Regan it was more about the flexibility the industry offers and the thrill of owning and operating his own business. Luckily, for the customers of Santa Barbara Auto Detailing, Regan’s detailing approach has come a long way since its dish soap and a bucket roots. When Regan first entered the industry, he partnered with a detailing professional looking to break intothe Santa Barbara market. As a lifelong resident of the city, Regan had a large network of friends and acquaintances he could tap to help get the business off the ground. In the early days, Regan would set the appointments and his partner would take the detailing lead, all the while training Regan on the finer points of auto detailing. With his partner’s instruction as his base, Regan evolved his detailing prowess over the years, training with some of the biggest names in the industry, including Ron Ketchum, Prentice St. Claire, and Renny Doyle. In fact, Regan’s detailing ability is now so evolved he was invited to be a member of Doyle’s famed Air Force One detailing team, an honor he has accepted three times. Regan has built an extensive detailing resume, but he is still a teacher at heart. It is that obsession with education that fueled him to acquire his detailing mastery, and compels him to share what he has learned. He is a frequent poster on industry forums, willing and able to pass along his detailing expertise to fellow detailers looking to up their game. While the willingness to share his knowledge with fellow detailers is not unique in an industry known for open collaboration, his readiness to share his detailing secrets with his clients is. Many detailers prefer to keep their clients dependent on their services, but Regan is willing to share his knowledge with them and help increase their detailing interval. 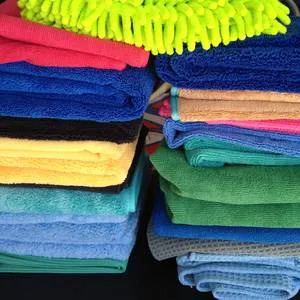 Regan owns and operates the successful detail supply business Towel Pros. As the name implies, the business’ biggest seller is towels, but Regan also vends a tailored assortment of various detailing supplies. One of his best sellers, and a product he uses himself on every car he services, is Optimum Opti-Seal. He often demoes the product for his detail clients, teaching them how to use it and keep their car’s just-detailed shine. What is his biggest concern is leaving his loyal following of detail clients satisfied and coming back for more. 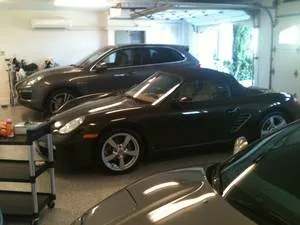 Santa Barbara Auto Detailing is primarily a mobile business, and many of Regan’s top clients entrust them with the keys and codes to their garages so he can detail their vehicles even when they are not home. His details are performed with little to no water, utilizing a three-step process to keep his customers cars clean and shiny. First, he washes the vehicle with a waterless solution, allowing him to detail anywhere, anytime, and stay in compliance with California’s strict water conservation laws. 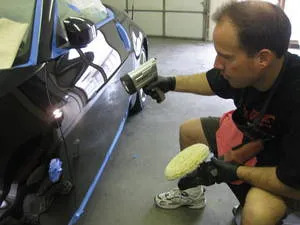 Next, he preps the paint with a clay bar or similar product to remove any lingering dirt and grime. 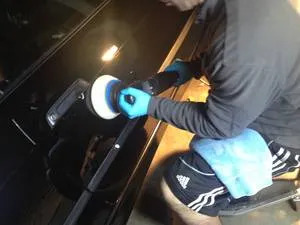 The final step is a one-step polish that adds a lot of gloss and protects the vehicle’s surface. He also offers a full-serve interior detail complete with steam cleaning. While Regan is skilled in the art of paint correction, the part-time detailer no longer performs those services. Opting to refer clients in need of serious paint improvements to others, so he can focus on his specialized three-step process. Regan is giving with his knowledge, services, and even his clients, but at the end of the day, he is still a competitive detail professional. The fact that he can be choosy with his client base is testament to his in-demand status. Over his 20 years in the industry the educator and entrepreneur has been loyally serving his detail clients, providing them with service with a smile — albeit on a part-time basis.